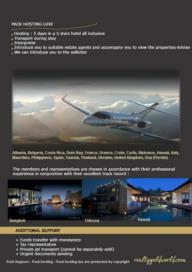 You are a buyer looking to acquire property abroad ! 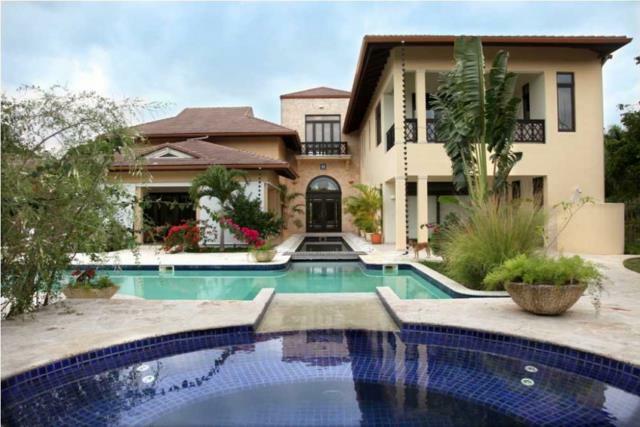 Windward Villa is a 6-bedroom Mediterranean-Style Villa and located in the elegant residential community Sea Horse Ranch on the north coast of the Dominican Republic. Sea Horse Ranch offers a variety of interesting amenities like a Tennis Club, an Equestrian Center, Ocean Front Pools and an Ocean Front Restaurant. Your family will love it. Windward Villa was designed by the award-winning American architect and built in 2009. One enters the villa through mature tropical gardens, across a wooden bridge that spans a fishpond containing Tilapia, Koi and exotic turtles. At ground level are 4 bedrooms each with en suite full bath. Next are wine room, dining room and Gourmet kitchen with huge pantry that opens onto an extensive outdoor kitchen as well. Connected to the kitchen are extensive service areas including laundry, staff apartment with bath, storage and mechanical rooms and 2-car garage. The second floor is accessed from the foyer via a spectacular curving stair contained in an octagonal stair tower. From the 2nd floor landing, two bedrooms with en suite bathrooms and walk-in closets are reached. Another room, reached by a stairway off the landing, is currently used as a media space but with its two balconies and air-conditioned comfort, it could also be a wonderful exercise/yoga/gym space. Finally, an open-air sky-terrace is accessed from the media room via a stairway and door. 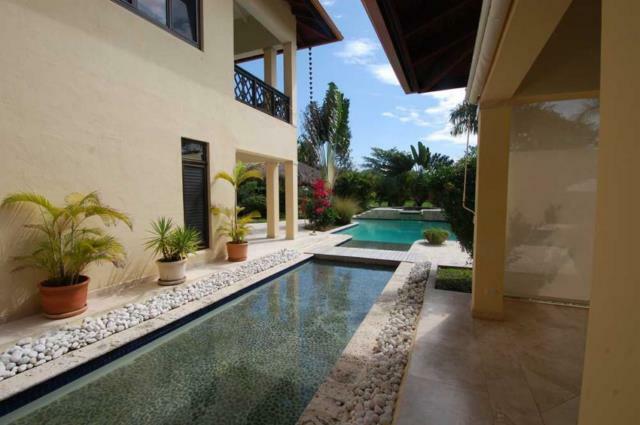 Furthermore the property offers a fabulous heated pool & spa combination with reflecting pool, coralina terraces and waterfall. 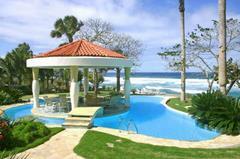 The villa is just a 2-minute stroll through palm groves to a series of spectacular beaches and sandy walking trails. The Puerto Plata International airport, 20 minutes away, provides daily scheduled air service from many US and European cities. 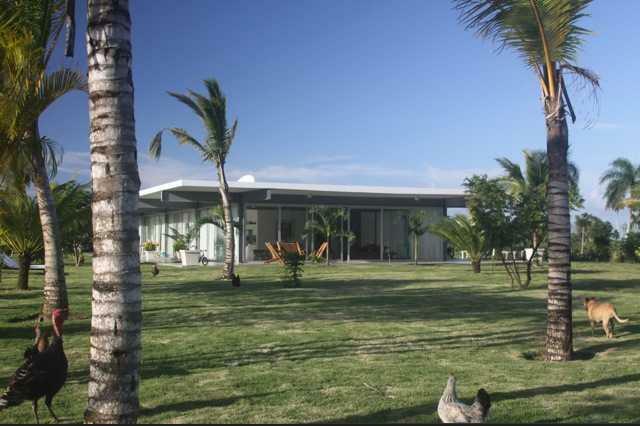 The villa is located on one of the 3 largest and most beautiful resorts in the Dominican Republic, the 100 hectare large “Sea Horse Ranch”, situated between Cabarete and Sosua, 15 minutes away from the Puerto Plata airport. The entrance hall has a large fountain made of coral rocks and leads to the Moorish living room with a canopy of round arches and 6 columns housing the direct illumination.The mahogany staircase leads to the gallery and from there to an open-air bar covered with a roof. Two masterbedrooms are on the first floor, each with a big walk-in closet and fantastic bathrooms.A staircase leads to the sensational tower room with a roof terrace that offers an incredible oceanview, from Cabarete to Puerto Plata.2 Masterbedrooms in the main building,1 office,4 bathrooms, 1 powder rooms,40 sq. meter beautiful mahagony kitchen,Pool with integrated Jacuzzi located on an elevated terrace.Guesthouse with 2 bedroms, 2 bathrooms and kitchen area.3 bedrooms are equipped with air-conditioning, all rooms have ceiling fans.Villa has its own power supply and the water is stored on the property in a huge cistern.Housekeeping is done in the service area that has a room for electric power supply, a hobby den, a storage room for garden implements, a laundry room, an ironing room, a bedroom with toilet and shower for the maid. 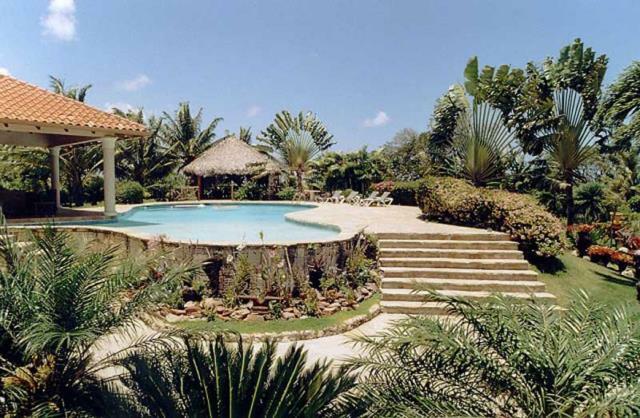 An ultra modern solar Hacienda surrounded by 3 1/2 acre of land with panoramic views of mountain and the valley in Jamao al Norte, Dominican Republic. This property is a magnificent, 10,000 sq. foot Mediterranean/Caribbean style Estate, only 15 minutes away from Cabarete and 35 minutes to the International Airport in Puerto Plata (POP). Set on the mountain with incredible panoramic views from every part of the property as well as the cool evening breezes. 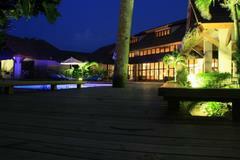 This Estate has been operating as a reservation only Gourmet restaurant and guesthouse. The possibilities are endless for this property. It can just be a great Caribbean Country Estate, Health Spa, Dude Ranch, B&B or a great ranching opportunity with cattle and horse breeding. From it's gourmet kitchen to it's large pool, the details will amaze you, but it needs to get finished. Amazing penthouse in Sosua with gorgeous sunsets every night, private beach access to the nicest beach of Sosua, panoramic pool directly over the ocean with whirlpool and a big sun-deck. 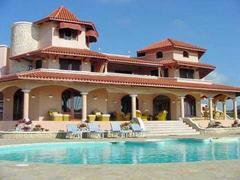 This is one of the best properties in Sosua and a must see project. 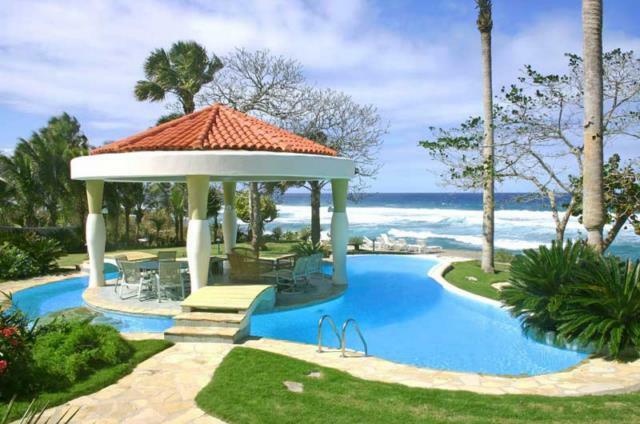 Stunning ocean views form Sosua to Puerto Plata with perfect sunsets every night, private beach access to the nicest beach of Sosua, panoramic pool directly over the ocean with whirlpool, big sun-deck, nice landscaping. 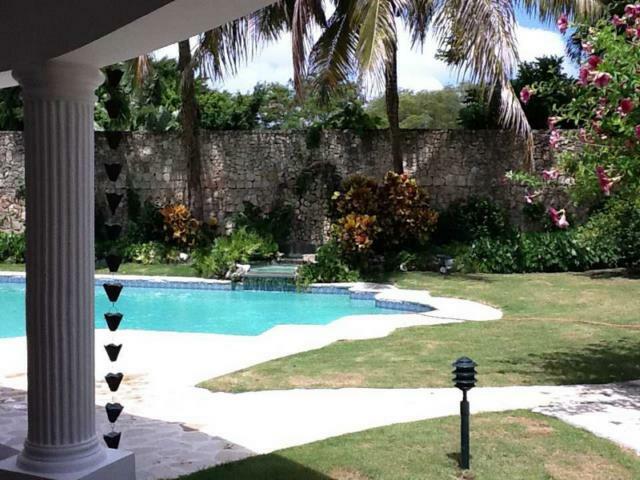 This is one of the best properties in Sosua and a must see project. 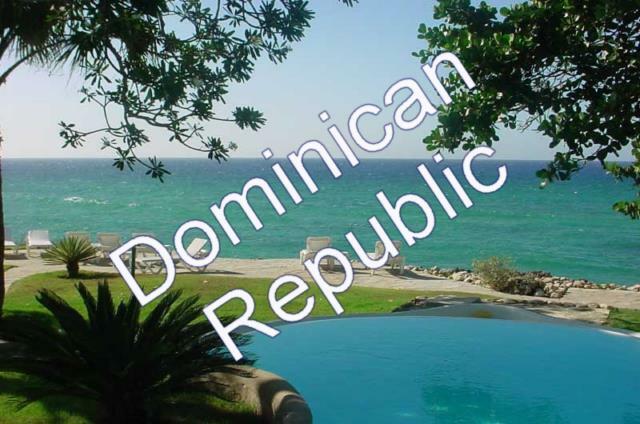 Stunning ocean views form Sosua to Puerto Plata with perfect sunsets every night, private beach access to the nicest beach of Sosua, panoramic pool directly over the ocean with whirlpool, big sun-deck, nice landscaping.The penthouse has aprox. 250m2 divided in 3 bedrooms (2 beds kingsize, 1 bed queensize) and offers sleeping accommodation for a total of 6 persons. The penthouse has 2 bathrooms (1 with whirlpool), a big kitchen with an island and breakfast-bar and a huge living-room with panoramic-views connected to the terrace. The place is Caribbean-styled furnished, A/C"s, cinema-TV's and decorated with nice art-paintings. 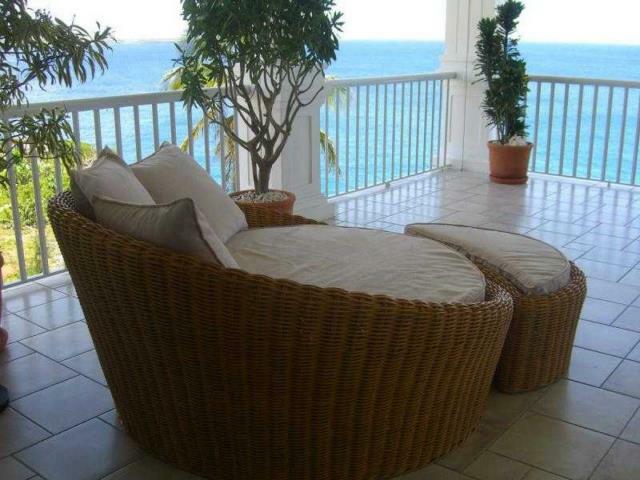 It is a perfect location for living or renting in the finest condominium complex of Sosua. 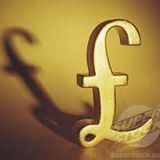 Everything you find in walking minutes: beach, supermarkets, restaurants, banks, medical care etc. 24 hours security and 2 privat covered parking spaces are available. 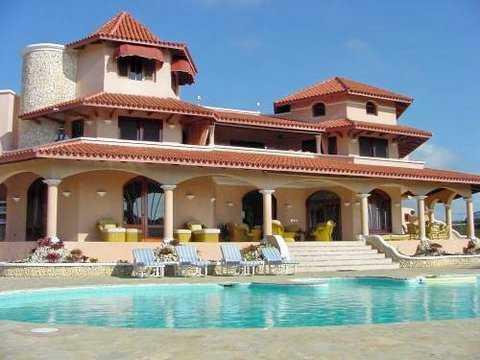 Only a few minutes away from the international airport Puerto Plata, schools, supermarkets, restaurants and hospitals. 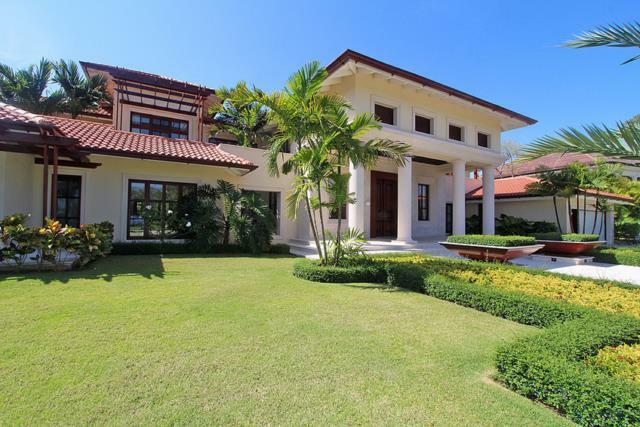 This 7100 square foot villa is magnificently set directly on the ocean in an exclusive gated resort community which offers a tennis club, horseback riding and a beach club and small private beaches on its premises. Art deco-inspired tropical masterpiece located in an exclusive private luxurious gated community on the north coast of the Dominican Republic. Only a few minutes away from the international airport Puerto Plata, schools, supermarkets, restaurants and hospitals. Relax in private, tranquil surroundings, hear the sound of the ocean, feel the luxurious trade wind breezes, awaken to birds and exotic flowers. This 7100 square foot villa is magnificently set directly on the ocean in an exclusive gated resort community which offers a tennis club, horseback riding and a beach club and small private beaches on its premises.Enter into a semicircular great room with curved ceiling to floor windows showing spectacular ocean views, soaring 20+ foot columns and an open air atrium at its center. There are five spacious air-conditioned bedroom suites, 4 en-suite baths and one adjoining bath. Two of the bedrooms are oceanfront and three have views of tropical gardens. A dining room and fully-appointed open kitchen surround the great room, all with spectacular ocean views. The media/entertainment room is equipped with a large screen flat panel satellite TV, DVD/CD/VCR and surround sound. Most rooms are open to ocean views and breezes.The circular infinity edge pool offers a shaded island gazebo in its center, ideal for lounging, catching up on reading, or alfresco dining. Its image has often appeared in travel magazines and other media. There are ocean edge sun decks, an outdoor barbecue, and a dining alcove suspended over the ocean, perfect for evening cocktails and for watching breathtaking sunsets.Many sports activities are nearby including golf, kite surfing and windsurfing, diving, sports fishing and mountain biking. Beaches, restaurants, bars, discos and casinos abound within a ten minute drive. This villa captures the essence of downtime, making the quintessential beach vacation home a reality in today's fast paced world. This four bedroom beach front villa will calm your senses and feed your soul. 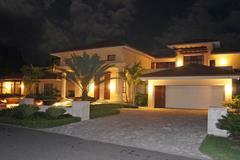 Located in a prestigious gated community on the north coast of the Dominican Republic. Asian influences can be seen in the raised wooden entrance and the outdoor walkways, as well as the palapa facing the sunsrise for yoga, reading, or meditation. Native Dominican coral floors containing gorgeous natural shell shaped fossils, the bathroom shower's perfectly round white stones from Barahona as well hand made hemp rope on the rafters are the natural materials that inspire you to relax and live in harmony with the sound of the ocean. 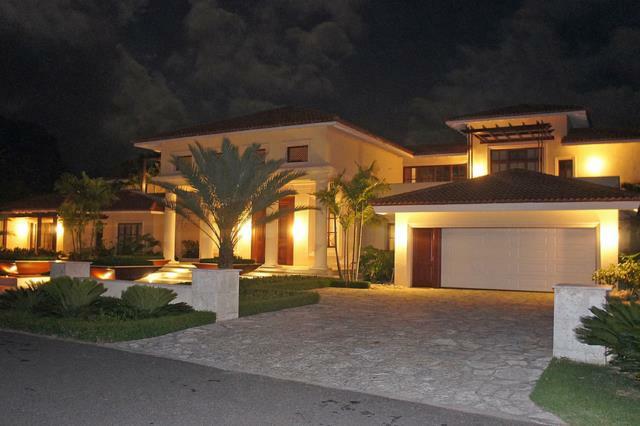 Enter its gated driveway and view one of the most incredible homes in the project. Every detail has been thought of in this beautiful home. Incredible lush landscaping, Orchid Gardens, natural stone walkways… This is the home to entertain in, with a fantastic pool area with its own island bar and views from the sea to the mountains. It even has a Billiard Room! Featuring 2 master bedrooms and 3 junior suites, this elite property offers a gourmet kitchen with seating option for 12 guests. A wonderful home with tremendous rental opportunities. 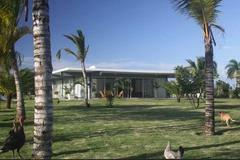 Located in one of the most prestigious international projects on the North Coast. Set in a rural atmosphere, 24-hour security, stables and tennis located on the property. This project has many Million $ homes already in place and other homes under construction. 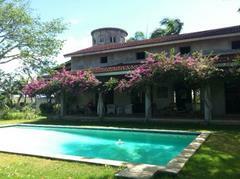 Haciendas El Choco is just 20 minutes from the international airport in Puerto Plata (POP). This Tropical Garden Villa is located in a wonderful residential development in a private & quite cul de sec and only a few walking minutes away from the beach club area. 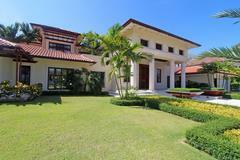 It is a spacious, open and inviting home with marble floors throughout the villa and a lush tropical garden. 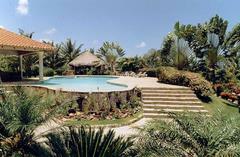 The large designed pool is enhanced with a lovely waterfall which adds a relaxing sound to the poolside. All five bedrooms are well designed for maximum comfort with ensuite marble bathrooms. Two enormous master suites open to a private terrace in the rear and front gardens and one features a totally private outdoor & open-sky Jacuzzi. All five bedrooms are well designed for maximum comfort with ensuite marble bathrooms. Two enormous master suites open to a private terrace in the rear and front gardens and one features a totally private outdoor & open-sky Jacuzzi. The other master suite offers an outdoor & open-sky shower. The two guest bedrooms feature ample open space and one has a private pool side terrace in the back garden. Three of the bedrooms have king size beds and one has a queen. The large service quarters with queen bed, full bath and shower can comfortably be used as a fifth bedroom. They all feature AC, fine Portuguese cotton spreads and high quality individual sound systems. An additional luxurious marble guest bathroom is located off the great room. A spacious, fully equipped eat-in-kitchen is located with easy access to the oversized pool terrace for catering and entertaining. A second story, private patio is an ideal retreat for sunbathing.